The XPS M1710 (£1499 inc. VAT) has been around for a while and uses high-end components, but it faces stiff competition from newer rivals. One feature that continues to impress is the excellent screen. At 17-inches, it's smaller than some, but actually packs in a lot of detail thanks to a resolution of 1920 x 1200 pixels (WUXGA). Images are pin-sharp and bright with excellent colour reproduction. The M1710 uses a single graphics card. In this case, it's Nvidia's 7950GTX adapter. It isn't as fast as the dual-card systems, but our benchmark game S.T.A.L.K.E.R. ran without trouble. Able to cope with such an intensive 3D environment, it's unlikely to struggle with any other game currently available. Sadly, the 7950GTX is based on DirectX 9 (DX9) technology, rather than the latest DX10 card. 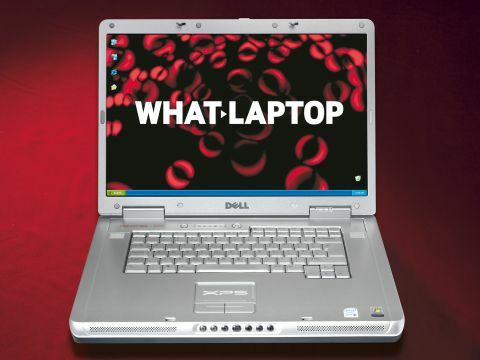 With Windows Vista installed, we found the Dell's 3D performance was quite disappointing. The large screen creates plenty of room for a good-sized keyboard. Moving near silently, the firmly attached keys help to add a quality feel. Unfortunately, despite the large width of the chassis, a dedicated numeric keypad is not included, which may restrict the usability of more complex games. The chassis is constructed from magnesium-alloy, helping to give strength, while keeping the overall weight at a reasonable 3.7kg. With plenty of vents in the chassis to expel warm air, the palm rests remained a lot cooler than many machines, helping to make this a comfortable laptop for prolonged use. Processing power comes from Intel's mid-range T7400 Core 2 Duo chip, providing more than enough performance for everyday use. 2048MB of memory helps to make this a smooth-running system. You'll find a 160GB hard drive in place. Proving a good all-rounder, you'll find six USB 2.0 ports placed around the chassis for plugging in your gaming peripherals. You'll also find VGA, S-Video and DVI ports which enable you to play games using an external display. It's also a good multimedia machine, with a range of buttons on the front for controlling DVDs. The XPS M1710 remains a good gaming system, but it's beginning to look its age. Performance fell short of the latest SLI machines, and 3D abilities suffered under the new operating system.